The blog of choice for the Canons High School Outstanding Pedagogy Project. Various researchers have extolled the benefits for pupils of conducting research which include greater awareness of their rights, increased confidence, motivation, literacy skills, criticality, data analysis and leadership skills (Child to Child, 2016 and Kellet, 2005). Pupils may be more honest with their peers than with adults and they may be more likely to take the results of research seriously when it has been conducted by people their age. When adults conduct research on children there is always a power imbalance and the risk that pupils will just say what they think the adult wants to hear (Kellett, 2005). With this in mind, I am trialling a child-led research project at Canons High School. The trial group is the student government, made up of a selection of children from Years 7-11. Sixteen children have chosen to take part and they have split themselves into seven groups. I started by teaching them about various aspects of research (based largely on Kellett, 2005) including criticality, ethics, the components of a research paper and data collection. Why do pupils misbehave in lessons? Does the welfare room look after pupils’ health properly? What techniques do teachers use to help pupils learn? Are tests effective to determine students’ achievement? Does the teacher’s gender affect subject choices that students make? The groups have begun to plan how they will carry out the research and some teachers have been approached to participate. When they have identified any pupils that they would like to recruit to take part in the research, I will help them construct permission letters for parents. We are still in the planning stage but hope to start conducting the research soon. Later on in the year, I will have a second teaching session with them about data analysis and dissemination. The aim is for them to share their findings in a way that they choose – perhaps by producing a video or by presenting to a selected groups of teachers. 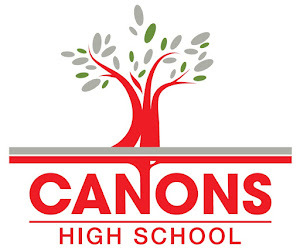 At this point, I am mostly interested in the process and whether it would be feasible to conduct pupil-led research on a larger scale at Canons High School. Kellett, M. (2005). How to develop children as researchers: A step-by-step guide to teaching the research process. London: Paul Chapman. How do you promote Professional Learning for all staff? At Canons High School, an inclusive 11-19 academy in North West London, with 140 staff, we had already moved to a more holistic approach towards staff effectiveness. 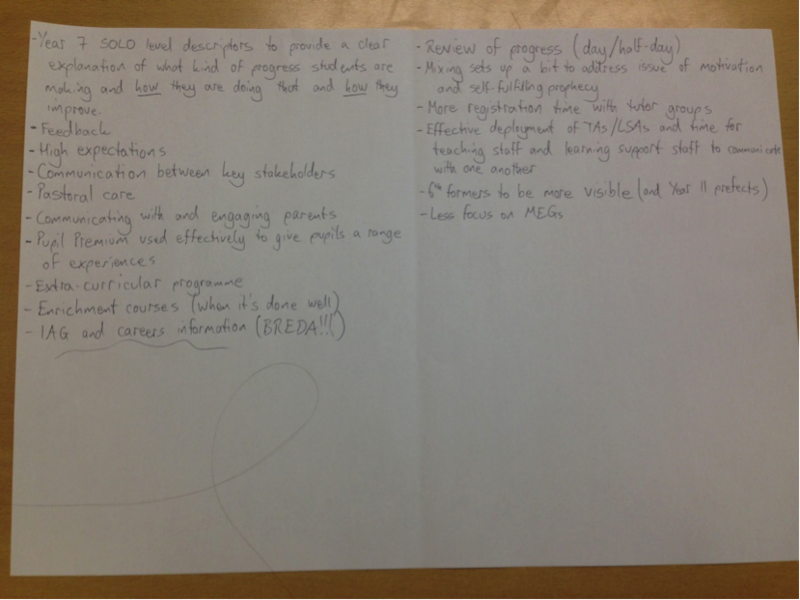 We wanted an approach that focused less on outcomes, more at looking at inputs and learning. In looking at what this future approach might be, we returned to research evidence, an important strand for us as a Teaching School Alliance. The research we used, came from London Challenge and its impact on student outcomes across London. In this research, what was striking to us, was the role that professional development and leadership played (see below), this gave us a direction for the future of professional learning, leadership and links to school improvement, at Canons. The other area we had already developed was a different leadership model, prior to becoming a lead school in the Canons Park Teaching School Alliance, using what we had called ‘Pedagogy Leaders’ (implemented in 2012). 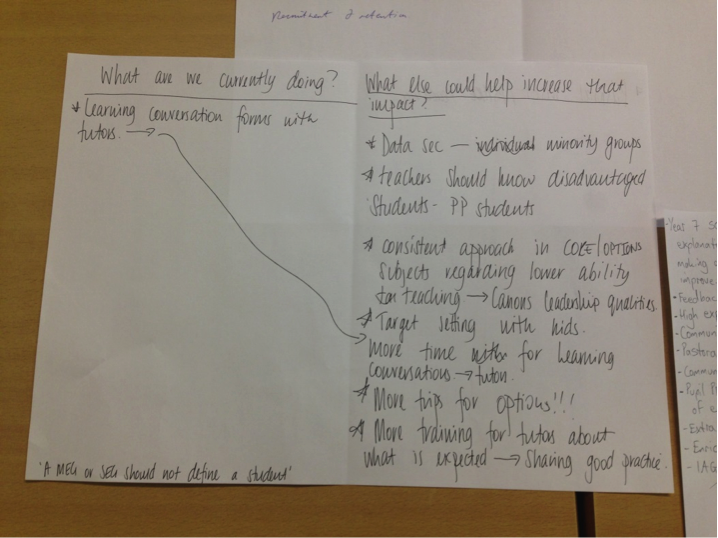 The key outcome from Pedagogy Leaders was driven by a school improvement priority, to improve teaching and learning. The leadership model itself (taken from a research basis as well) focussed on ‘highly effective practitioner led professional development’, with Pedagogy Leaders driving professional learning across a range of mechanisms. This was an approach that promoted opportunities for staff to learn and develop practice, with an important element of taking risks. This was an approach to pedagogy that was used successfully and developed in 2014 to a new role beyond pedagogy, which we called Grassroots Leaders, who are now being used to develop school improvement across a number of teams. These Grassroots Leaders are recruited from all roles within Canons, providing the staff concerned have the skills and aptitude for the role. The key final theme that we have incorporated in our new direction, was the idea of ‘Professional Learning Communities’ (PLC’s). This was a development which built on the Teaching and Learning Communities (TLC’s) at Canons, which had slots in our Monday meeting cycle, but were for teaching staff only and started in 2011/12. So what is a Professional Learning Community? Who should be thought of as a member of a professional learning community? The literature around this concept is mainly American and assumes members as only teachers. However in a UK context, the research we used, identified PLCs that rightly included support staff, and also highlighted the introduction of the Workforce Agreement, which made it crucial that support staff be viewed as potential members. What makes Professional Learning Communities effective? Baars, S. Bernardes, E. Elwock, A. Malortie, A. McAleavy, T. McInerney, L. Menzies, L & Riggall, A. (2014) Lessons from London Schools: Investigating the Success. CfBT and Centre for London. Bolam, R. McMahon, A. Stoll, L. Thomas, S. and Wallace, M. with others (2004) Creating and Sustaining effective Professional Learning Communities. Hord, S. (2004) Professional learning communities: An overview. In S Hord (ed), Learning together, leading together: changing schools through professional learning communities. New York: Teachers College Press. Louis, K.S. Kruse, S. D. & Associates (1995). Professionalism and community: Perspectives on reforming urban schools. Thousand Oaks, CA: Corwin Press Inc. Discussion forum – Each session led by a variety of staff who had completed an MA. Discussion focussed around their MA research with an opportunity to learn and discuss. Leadership 2020 – developing self and others – With a focus for developing the skills for System leadership in those aspiring towards SLE status, leading and developing teams or individuals at every level. Well after positive evaluations from the last academic year, September 16 sees a new set of PLC opportunities for all staff, including lunchtime drop in sessions and an additional slot in our Monday meeting cycle, which we have identified as being an opportunity for collaborative work and joint practice development, for all staff. Our next test is using technology to capture professional learning and enhance knowledge capture, to make us a learning organisation which delivers for our students. What is the role of the attached form tutor? As an NQT last year I was part of the year 9 team as an attached form tutor. I found the role to be a valuable experience which helps further embed the pastoral side of school from teaching placements. Being an attached form tutor is a great way to build a foundation to becoming a form tutor who is responsible for 28 pupils. 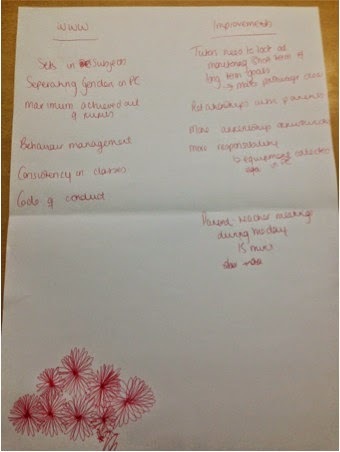 I felt I wanted to find out about a variety of other things I could have done within the year group as part of my role. This post will focus on a teacher learning community (TLC) session which concentrated on the role of the attached form tutor. Our TLC as a whole had a pastoral focus and after discussing the role of the tutor it became apparent that the role of an attached form tutor differed depending on the year group. 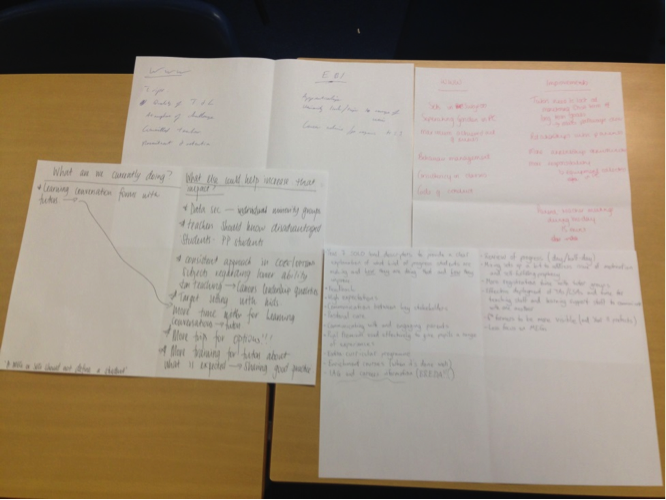 Consequently, as a group we decided to discuss and find areas of similarity across year groups and ways the role could become more effective and clear. What else can an attached member of staff do? How can they play a bigger role in the year team and for the year group? Run focus groups with some pupils of the year, to help improve behaviour, conduct and respect. Use morning registrations to have learning conversations with pupils- having more contact with certain pupils to offer more support. Share a consistent message to all tutor groups from the HOY to insure that all form tutors are delivering the same message. To sum up, it has been highlighted that attached form tutors could play a varied and are a valuable part of the year team as a result of discussions in year team meetings and concern meetings. It should be recognised that the role of the attached form tutor should be kept flexible and used as the HOY sees fit. The Students and Achievement Team were tasked with the responsibility of looking into Canons current use of electronic systems. We decided that rewards would be our immediate priority and began to research our current system. We have been using Vivo Miles. Vivo is a web-based rewards system that aims to improve student engagement and help achieve school values. Vivo points are awarded to students for positive behaviour, good work and contributions around school. These points can then be used as a currency for students to save up and purchase rewards on their own account. We undertook a full audit of staff use and student experience of Vivos and rewards. We used the data recorded within Vivo to determine how often departments/staff use the system and to see which year groups receive the most Vivos. We then disseminated a questionnaire for staff on the use of Vivos. The results informed us that 38% of staff rarely or never use Vivos. The main reason being the method in which they are currently distributed is difficult to use on a practical basis. Teachers in a classroom environment found it very awkward and long winded to log in to the web based Vivo system, often didn’t know their login details as they are separate to SIMS and therefore would not use the Vivo system. A student survey across all Key Stages informed us that the majority of students across all key stages still value Vivos – even KS5. We didn’t expect to see the KS5 students value Vivos but they overwhelmingly agreed that Vivos are a great incentive to achieve. Almost equally there were requests for more positive comments to go directly to parents/carers. I visited Whitmore High School to look at their use of electronic systems. They use a SIMS based reward system that utilises InTouch. InTouch can use SIMS data to automatically send messages to parents/carers. This was a “Light Bulb” moment. I thought “Maybe we’d be able to use SIMS to distribute Vivos”. Further investigation taught us that this was possible. We have now simplified the process of awarding Vivos by using SIMS. Within a register as well as selecting an individual or a group of students, any member of staff can simply use the achievement tab to reward a student individually. This means no additional log in for staff. By using this system the achievement is recorded within SIMS and InTouch can send messages home. We have decided that a trial will determine the number of points/Vivos that trigger a message being sent home via InTouch. Promotion throughout the school will be essential. We will produce posters for classrooms and clear guidelines for all staff on how to use the new system. The trial will also determine how data is collected for Heads of Year and Heads of Department so they are able to analyse achievement quickly and easily. - Sustains a fair and consistent approach to rewards across the school. - Fulfils the students’ requests for how they would like to be rewarded (parental notification). - Fulfils staff requests for easier use thus improving the chances that students will be rewarded. - Records achievements directly onto SIMS. - Builds on the Canons ‘talking school’ ethos that promotes open dialogue between stakeholders. I had the opportunity to present this project in an all staff meeting. It’s still in its early stages, but the feedback from staff has been overwhelmingly positive. One teacher said “Thank you, it’s so quick and easy now. I never used VIVOs before but I will now.” I have had many other members of staff say similar things. It is now my responsibility to keep this system consistent throughout the school. The trial will inevitably find some kinks but I hope this system will promote the use of rewards throughout the entire school. When it comes to using research evidence in schools, the only question that seemingly matters is ‘What works?’ So much so that the government created a What Works Network, which includes the Education Endowment Foundation (EEF). Its mission is to discover what works in classrooms… so we can all sit back, relax and wait for the answer to roll in, right? Well, no, as those at the frontline are only too aware, it’s not that simple. The EEF’s James Richardson noted that there may be “more similarities between schools than difference“, but there are still no silver bullets when it comes to ‘closing the gap’. Context will always be crucial to the success of an intervention. Indeed, we should think of research findings as telling us what works… some times and in some places. A recent visit to Canons High School in Harrow gave me an opportunity to see how one school is tackling these questions. Its headteacher is Keven Bartle, who emphasised the need for teachers not to be mere consumers of research but active producers and critics. And this philosophy is evident in the school’s approach. For starters, Canons has a designated research advocate and its CPD offer for teachers includes lesson study and a book group that is currently debating the merits of Full on Learning by Zoe Elder. From next year, Canons will also be trialling a journal club to give teachers the opportunity to engage with academic review articles and discuss how these findings can inform their practice. The school will be working with Sam Sims of UCL’s Institute of Education to evaluate how effective this approach proves. Participants choose what to read, how to interpret it and work together on how to implement it in the classroom. It’s about empowering teachers by linking them directly with the latest education research. So if we’re aiming to get teachers enthused about research, school leaders and governors can play a vital role by ensuring that school cultures and CPD programmes encourage teacher-led critical engagement with research. Ultimately, getting to grips with why an intervention is likely to be successful (or not) in a particular context, understanding how to effectively evaluate its outcomes, and knowing when to adapt or abandon a failing strategy are the skills we need to develop. That’ll be what works for pupils. Canons High School is thrilled to announce that our student band JJ Jam have been invited to perform in front of over 10,000 people at the opening of the Rock Assembly event at Wembley Arena on the 1st of July. The band has been awarded this exciting opportunity following their fantastic victory in this year’s Act 10 talent competition to find the best school band in the UK. It is a great honour for the band to have been asked to perform at this hugely prestigious event, considered the biggest and best school event in the UK. Previous performers include Professor Green, Ella Eyre and the Saturdays, to name but a few so we are extremely proud that JJ Jam will be able to add their name to this illustrious list of artists. The school’s excitement and pride in JJ Jam’s huge success was echoed by the band’s lead singer….. In September 2013, Canons High School hosted #TMCollaborate, a TeachMeet whose aims were: 1) to share experiences of effective collaborative working; and 2) bring teachers, departments and schools together in new collaborative ventures. Almost two years on, Canons High, Park High and Bentley Wood School are joining forces once again to bring you AchieveMeet: a celebration of all the wonderful work that goes on inside and outside the classroom to help raise student achievement in its broadest sense. What exactly is ‘achievement’? Achievement is something that has been done or achieved through effort: a result of hard work. This AchieveMeet, taking place on Wednesday 8th July from 5.00pm – 7.30pm, will be made up of presentations and information stalls from a wide range of staff across Harrow schools in a variety of different roles. We would like to hear success stories from teaching staff, tutors, LSAs, support staff, pastoral staff – essentially anyone who has played a big part in ensuring that our students have the opportunities to experience a sense of achievement. It may be a considerable improvement in their attendance/punctuality, it might be their commitment to an extra-curricular club, their perseverance to complete a challenging task, their student leadership (mentors, prefects, peer-listeners, literacy leaders, school council, etc. ), and so many more things. Any opportunity that staff have given students to feel a sense of personal achievement! It will be a chance for staff to celebrate the hard work we all put in to give our students plenty of opportunities to experience success in some shape or form during their time at school. As the focus is on student achievement, the hope is that a wide range of staff in a variety of roles will be interested in being involved in this AchieveMeet, either as a presenter (individual or part of a group), or to set up an information stall if you're not fond of presenting, or as an audience member. Please e-mail me tmegit@canons.harrow.sch.uk if you would like to discuss this in more detail, or if you think you would be interested in getting involved. How does Canons crack the code and contribute to improving social mobility? 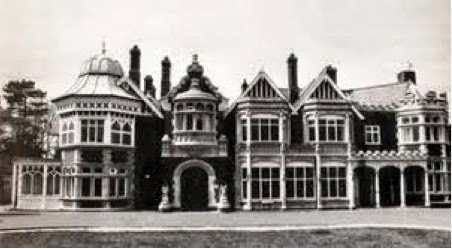 Bletchley Park. During WWII the German secret codes were broken here. On a more positive note however, the report also reveals there are schools that have cracked the social mobility code ‘some schools seem to have learnt the secret of how to alleviate the impact of background on life chances. They have found a way of overcoming the barriers that impede social mobility. 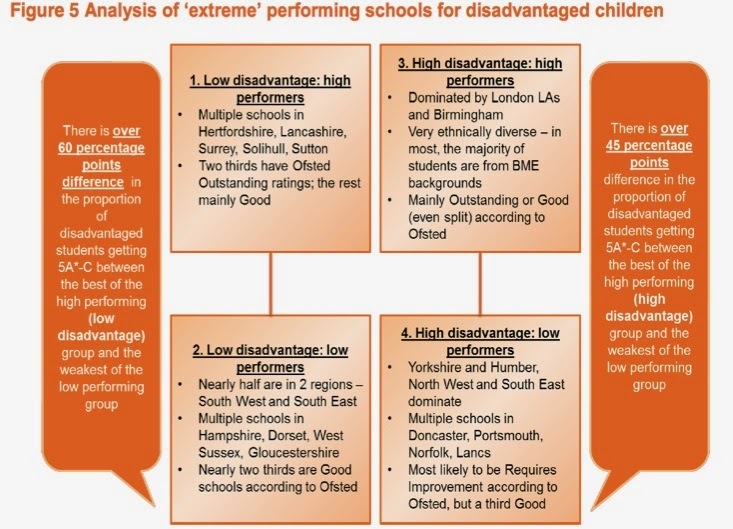 At a time when social mobility is stalling and child poverty is rising, there is an urgent need to share the lessons so that every school can crack that code.’ The report shares some interesting findings from their investigation about what such code crackers do to make an impact on raising achievement for disadvantaged pupils for example a common feature of such schools is 'properly resourcing teacher recruitment and development, partnering with other schools and ensuring disadvantaged students have (at least) their fair share of the best teachers’ time – not just subcontracting the teaching of low attainers to teaching assistants or focusing the best teachers on students at the C/D borderline' this is clearly an example of good practice. The report concludes that their investigations into code breaking schools 'suggests that those performing well for disadvantaged students do not apply a single magic formula. Success is incremental and based on a series of small changes rather than a single ‘big bang’ – compared by one headteacher to ‘being like the success of British cycling team: the aggregation of marginal gains’. With this idea in mind, the TLC session therefore focussed on discussing and sharing such 'marginal gains', the 'small changes' and key strategies Canons uses to ‘crack that code’. At the same time, as staff at Canons are very reflective and are always looking for ways to build upon areas of strengths so, as well as sharing what we currently do well academically and pastorally to close the gap, we also collectively discussed ways we could further increase the impact. As the government report makes clear, ‘there is an urgent need to share the lessons so that every school can crack that code’ this post therefore aims to share the good practice at Canons. 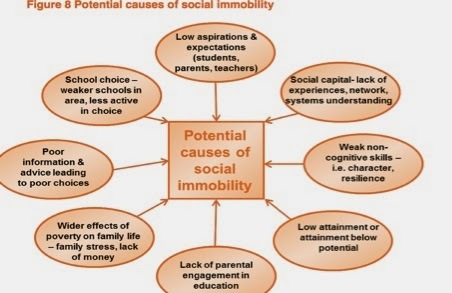 Social mobility – what is it? 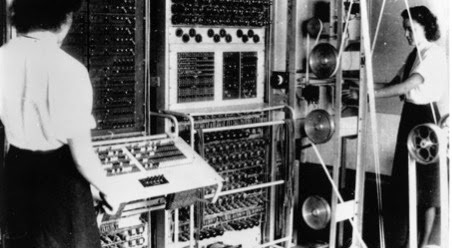 What do good schools do and what makes a code breaker? 1. There is a lot of scope to improve performance. · ‘Refugees and asylum seekers and those students who join the school outside normal times also make outstanding progress. 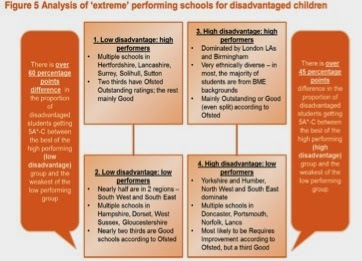 · There are smaller gaps in attainment between students eligible for the pupil premium and other students than are seen nationally – between one third and two thirds of a GCSE grade lower in English and mathematics. In 2012, a very high percentage of eligible students made the expected progress in GCSE English, higher than other students and the opposite of the national picture. In mathematics their progress was very close to that made by the others. · Younger and older students also benefit from the pupil premium, which is used to finance their participation in trips and to provide extra staff to teach them in small groups. The school’s Year 6 summer camp will be strengthened by funding for Year 7 catch-up premium. What are we currently doing well? What we can do even better to increase impact? · More training for tutors about what is expected – could we have a pastoral inset? What is expected and sharing good practice? Our discussions about closing the achievement gap have meant that the importance of the pastoral system and the relationships between tutors and their tutees has continually come up as an area of real significance in terms of closing the gap in student achievement. This is particularly important in light of the changing role of Heads of Year and tutors to also encompass the academic wellbeing of students. Fittingly, our next TLC we will be focussing on the role of the tutor led by our lovely NQT Minal Tailor.